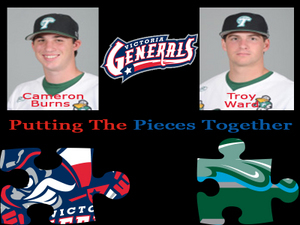 April 1, 2014– The Victoria Generals of the Texas Collegiate League have announced the addition of two players from Tulane University to the 2014 roster. Catcher Cameron Burns and pitcher Troy Ward will take the field for the Generals this summer. Cameron Burns, a native of Bellaire, Texas, became the first freshman to start at catcher on opening day for Tulane since 2006. Cameron appeared in 46 games (with 39 starts) all at catcher in his freshman campaign. Cameron was tied for fourth in Conference USA by throwing out 16 base runners on the year. Cameron earned Conference USA Commissioner's Honor Roll honors.
" Cameron is solid defensively with a strong arm that can really challenge runners," stated Mike Yokum, GM of the Generals. "He is the kind of player that will demand respect by other teams trying to advance runners. " Troy Ward, a North Richland Hills, Texas native, played an integral part in the back end of the bullpen for a Trinity squad that finished 40-9 during his freshman season. Troy placed second on the team with three saves while notching a 1-1 record with a 3.09 ERA. Troy struck out 12 batters and was one of only two Trinity Tigers to not walk a batter on the season, Troy held hitters to a .231 batting average on the season. Troy transferred from Trinity to Tulane this season.
" Troy has outstanding control and a strong ability to strike batters out, "commented Yokum. "He will be one of the guys that we will call on to help us close out games this season." Burns and Ward will be the first players to play for the Generals from Tulane University. The Green Wave are coached by Rick Jones who is coaching in his 21st season with Tulane. Season tickets for the Victoria Generals 2014 season are on sale now as the Generals prepare for their home opener against the Texas Marshals on Tuesday, June 3 at 7:35pm at Riverside Stadium. Fans can buy season tickets and team merchandise at the Generals team store located at 1307 East Airline Road, Suite H in the Town & Country Shopping Center, online at www.VictoriaGenerals.com, or by calling 361-485-9522.